Title IX of the Education Amendment of 1972 banned the exclusion of students from programs or activities on the basis of gender in American schools. 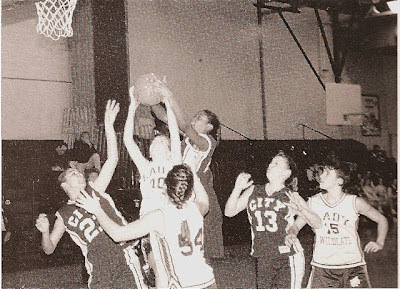 This progressive law has allowed girls’ teams to flourish at public high schools. Nonetheless, most teenaged sports books are written for boys, even though nearly as many girls play sports. It's time to address the lacuna. In 2007 Razorbill (Penguin) started publishing the Pretty Tough series about girls who play sports. Liz Tigelaar wrote the first two novels about soccer and football. Young adult author Keri Mikulski has picked up the ball for the next four books in the series. If the name sounds familiar, it’s because Keri is a member of our book review club. Her publisher sent me an ARC to review on my request. 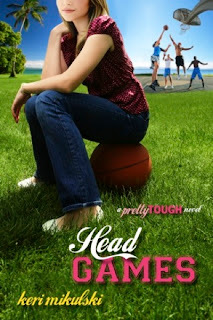 Head Games by Keri Mikulski is a sweet basketball romance. Taylor is a six-foot-tall (and still growing!) freshman. Her phenomenal basketball skills have earned her the center position on the girls varsity basketball team. However, her height is “a serious boyfriend handicap” off court. Playing Seven Minutes in the Closet, Taylor is humiliated when a shorter boy chooses to watch the clock on his phone instead of kissing her. Only the boys basketball center is tall enough to look her in the eye, but unfortunately gorgeous Zach is dating her teammate Kylie. Team dynamics are shattered when Zach dumps Kylie and starts shooting hoops with Taylor. Adding to the stress, Taylor’s best friend needs her to play fashion model for a designer competition. A self-described “people pleaser” and klutz, Taylor has to learn how to be more assertive and self-confident off the court. The romantic shenanigans were amusing, but I was a bit bothered by how romance ruined the girls’ game but not the boys’ game. Still, in the context of this story, it made sense, and the main character certainly took sports seriously. Taylor is a sweetheart who would make a fine role model for tween girls. Head Games is a quick and easy read, but you had better know your Gossip Girl and teen pop culture to get all the references. Facebook takes a lot of court time too. This fun and engaging novel would appeal to reluctant readers and to sporty girls ages 10-14 years. Even a non-basketball player like me (I’m 5 foot 3 inches) could understand the plays and appreciate the drama. Keri Mikulski is on top of her game. Head Games will be released tomorrow on January 6th, 2011 in the USA. Congratulations, Keri! "From as far back as I can remember, I’ve always loved sports and books. However, as a teen and tween, I fell out of love with reading. For years I never picked up books for pleasure because I couldn’t relate to the main characters. They weren’t like me. They didn’t play sports. "Then, decades later, I witnessed many of my sporty middle school students also morph into reluctant readers. As soon as I began writing professionally, I set out to write the books to reach this audience. And here I am – living my dream." Sarah: how did you end up taking over the Pretty Tough series from another author? Keri: About three years ago, I began writing web articles for the Pretty Tough website. While writing for Pretty Tough, the brand read Screwball, asked me if I had written any other sporty books, and requested to read my work in progress. At the time, I was working on FULL COURT PRESS (which is now Head Games). I sent Pretty Tough FULL COURT PRESS and they loved it! Immediately, Pretty Tough asked me if I would be interested in writing novels for the brand. Since I absolutely adored the first two novels (written by the amazing Liz Tigelaar, executive producer of Life Interrupted), I accepted the offer and we began the process of attempting to sell the series again with Head Games through my agent. Has this constrained your writing? Not at all! ☺ I LOVE writing sporty books and I was honored to continue the series after Liz did such an excellent job with the first two novels. Since it’s been four years since the first two books were published (the original characters sadly graduated from Beachwood Academy), the only two elements that stayed the same are the setting and one character. How did you research the California setting and the techno-savvy habits of contemporary teenagers? Since I’m a teacher, I spend a TON of time with teens and tweens. I have a front row seat to their technology habits. Technology has drastically changed the way teens and tweens communicate with each other and I find the subject both fascinating and scary. 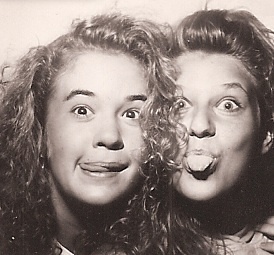 The photo booth picture is of my best friend (right) and me at the same age as my protagonist. Ha! Classic. Were you a teen athlete like your protagonist? Are you still involved with sports now? When I’m not writing or on deadline, I love, love, love to play sports. When I can, I participate in adult soccer and softball leagues, but my favorite sporty times are with my daughter and hubby. How do you balance career and family? Basically, I live by this rule. When I’m with my daughter, I’m with my daughter. When I’m teaching, I’m teaching. When I’m writing, I’m writing. I try to write around her schedule – write at night and in the morning. Can you give us a sneak preview of the next three books in the Pretty Tough series? Reformed mean girl Kylie Collins desperately wants to put the craziness of basketball season behind her and concentrate on her lifelong dream – being recruited for Division One softball. She also wants to move on from her cheater ex, Zachary Murphy, which isn’t exactly easy when Kylie’s living in his backyard guesthouse with her father after her parent’s divorce. But when Kylie arrives at her first softball practice of the season she comes face-to-face with her worst nightmare – Amber McDonald, the best pitcher in the state. Now, Kylie’s forced to warm the bench as Amber wows crowds again and again. With all the drama happening out on the softball diamond, Kylie finds herself drawn back to her bad habits – sabotaging people and hanging out with a certain Zachary Murphy. When are the other books due out? Stealing Bases will hit bookstores on July 7, 2011. Book 5 and 6 will hit bookstores in 2012. Thanks for having me, Sarah! ☺ Happy New Year! Thanks, Keri, I'm looking forward to Stealing Bases. Book Blog Watch: I’m not the only blogger who has noticed the dearth of sporty books for girls. Steph Su Reads included athletes in her list of “What’s Missing in YA Lit?” Reading in Color called for a protagonist “To be Young, Athletic and a PoC.” She goes on to list several sporty books featuring People of Color, beyond African Americans playing basketball. Blog readers, do you have any book recommendations about teenaged girls playing sports? My work in progress, A MATCH FOR EVE, is about an American softball player who goes to England to play cricket. I could also do with some cricket book (boy or girl) recommendations. I swear that I am not belittling your earlier interviews, but I loved this one so much! Firstly, there was a geeky element to it, and I mean geeky as in fun and healthy component. I even loved your emoticon! I'm always surprised at the (false) notion that girls don't like sports. Talking about cricket, the England women's team wiped the floor with their opponents in the latest world cup, last year, whilst the men... well, they have just managed to regain the Ashes against the Aussies. The book sounds like a fun ride, I'm just a bit wary of too many Facebook and Twitter references. However, I loved that line you quoted about the main character being called 'hot' only by her mum when she was sick. Very funny. Thanks for the interview (I enjoyed it so much that I read it twice!) and for the recommendation. Looks to be a great series of books! My daughter loves playing basketball, softball and soccer would enjoy reading these books. What a wonderful book, pics, and interview! I used to play sports in school, but, back in my day, it wasn't "cool" once you got to a certain age so I ended up not playing sports (or riding a bike) beyond junior high. But I'm an avid baseball fan and every time a batter gets up, I imagine it's me (baseball runs in the family - grandpa was a minor league pitcher). Wishing Keri the best on the book! I won an ARC of this book on another blog. I got it recently and moved it to the top of my TBR pile. Great interview! Thanks for sharing. I'd never thought about the lack of sports books for girls, but I think it's wonderful that YA writers are noticing this gap. Anything that will appeal to more tweens and draw them into reading is a definite positive! 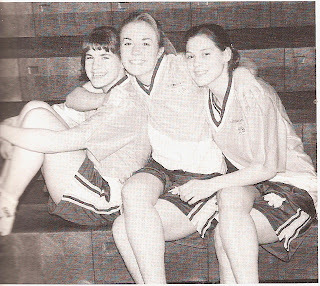 I was not a sporty teen, but a lot of my classmates were. Sounds like a great book! Great review and interview, Sarah! 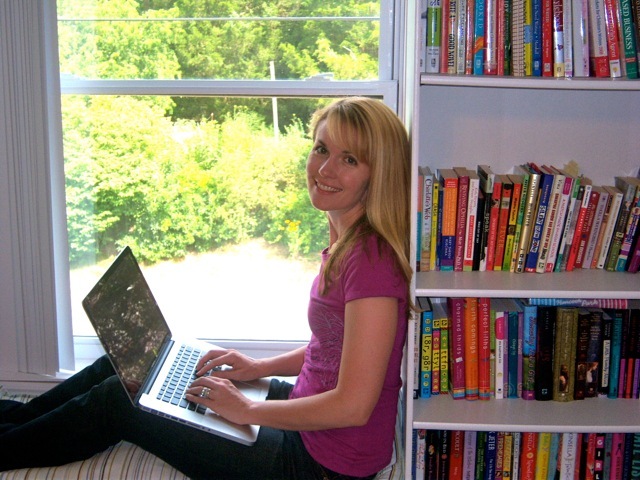 I adore Keri and love her sports-themed books and the athlete interviews she does on her blog! Thank you! ACIL, the emoticons were actually put there by the author. I interview via email usually. Keri knows how to communicate on the teen level, and this book is definitely geared for a younger audience. That is cool about women’s cricket. My husband has been glued to the cricket results through Ashes. Now I sort of get it. Tracy, I’m sure your sporty daughter will enjoy these books once she’s ten. Kathy, how sad to give up sports and biking. Keri, thank you for the interview and dropping in! Susan, I’m looking forward to your review of Head Games. Rose, it is great to have sporty and tall girl books for the overlooked (or underlooked?) readers. Stacy, I bet your friends would have enjoyed this book back then. Kelly, thanks for adding your endorsement for Keri’s writing. This series is so exciting! I'm already impressed by the fact that the norm today is to have arm muscles and be in shape--so different from when I was a teen. And it's healthy and inspiring that you're writing this series, Keri. Thanks for another great book review package, Sarah. It's great to see some sports-focused books for tweens and teens. I don't read too much from these genres, but sports are definitely under-represented. And to have wit and romance and great characters too--that's awesome! Loved the review and interview combo, as always--such a nice format! Congrats to Keri as well! sounds like a fun book and that was a great interview. How fun that she reviews for the book club. I had no idea she was an author. I'm so glad there is such diversity in books these days and that girls who play sports get their stories told. Thank you both for an interesting interview. And I love that writing advice--that's what matters most, to write what drives you. Sarah and Keri, I loved everything about this post--the review and the interview! And, of course, the photos! I forwarded the url to my friend who teaches high school English. I can see how reluctant readers would gobble up Head Games! Thank you. Thanks for this nice review and interview! I enjoyed them a lot! Sports-focused novels and mangas are very popular among young people in our country too. And they sell quite well. Most of the popular books have been adapted into films and made into TV series. Nice lively interview! I like your questions. And I like Keri's writing advice and the fact that she does not feel constrained as a writer of this series. Most of all, it is good to learn of this series of sporty books for girls. Movie(s) next, maybe? Our family has watched all of the sports movies for kids, tweens, teens, hollywood has put out there - at least twice already. It's time for more! any ya book with subject matter that diverts from the protagonist focusing primarily on their appearance, attraction to boys or on mean girls, etc is music to my ears. of course all the above necessarily plays a role in ya fiction, but it's so refreshing to read about a young girl pursuing a passion such as sports. thanks, sarah, for this interview - and i look forward to hearing more about not cricket! Interesting. "Sporty books" is another new concept for my not up-to-date mind. Some years after Title IX I remember teacher a Humanities Class to senior and requiring a read of a little gem I found in our elemtary school. Its title was "Don and Donna Go To Bat." Now it's still on some Dr Suess recommended library lists. Adults reviewer still find it "wonderful." The ending of the story was horrible and wasn't because Donna hit a homerun for here sick twin with her long hair hidden under her baseball cap. As a reward she got to be team manager and cater to the boys. My students and not only the girls pic up on that right away. Ellen, Alyssa and Kaye, thanks! It was fun to read a YA book from one of our book club reviewers. Head Games has plenty of muscle, romance and wit. Barrie, thanks for hosting another book review club. I’m sure these books, like yours, will be popular in the classroom with kids who don’t usually enjoy reading. Sapphire, I can believe that sports-themed manga would be popular with teens in Japan. Thanks for sharing – it’s nice to get a cross-cultural comparison. Mama Shujaa, I think Head Games would make a fun teen movie or after school special on TV. Sarahlynn, maybe your daughter will figure out how to play volleyball on the moon. You’ll be amazed by how quickly little kids grow. Our son at age 16 has passed his dad in height. He doesn’t play basketball but is on the Nordic and Crew teams. His 13-year-old sister is almost my height and plays soccer and lacrosse. As a kid, I got into competitive riding after reading horse books. It’s great to see more sporty books for our kids. Amanda, good point about the norms in teen books. Discovering and developing latent talents is a joyful part of the teen years. I’m certain to have more to say about NOT CRICKET. Thanks for your interest! Troutbirder, it’s good to see that blatant sexism is no longer accepted. Your students could teach those backward reviewers. I think this series of books is going to be a big hit with many girls. I loved the interview and review. Really terrific job Sarah. Thank you! I unfortunately don't have any sports YA book recommendations but think it is great that someone is trying to fill that gap in YA lit. Sarah, I really appreciate the structure of these posts. I know they're a lot of work, but the result reflects your attention. And a YA series about girls who play sports is long overdue. Yay!